My first autumnal bake of the season is this sticky and smelling of cinnamon and orange zest Pumpkin & Cinnamon Pull Apart Bread! 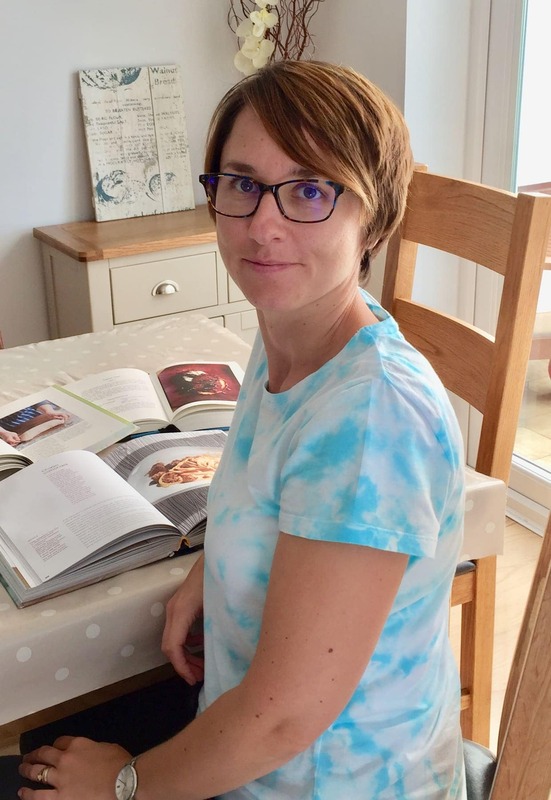 If you’ve never made bread like this before and are little apprehensive, fret not as I shall guide you step by step (with photos) so that you can make and enjoy it in no time! This bread is one of the tastiest and stickiest yeasty creations I’ve had an ultimate pleasure of eating. 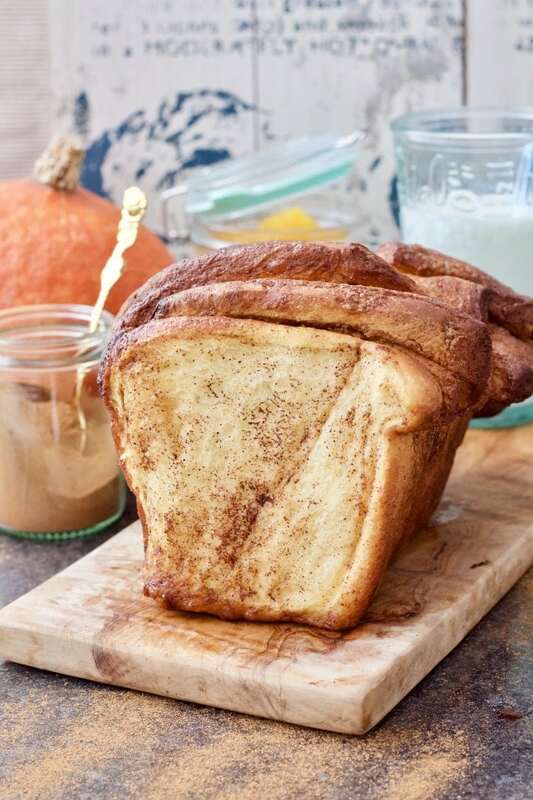 It’s really not that difficult to make at all and the pleasure of pulling apart lovely, still warm slices only to reveal yet another fluffy pillow of cinnamon goodness is a pure pleasure. 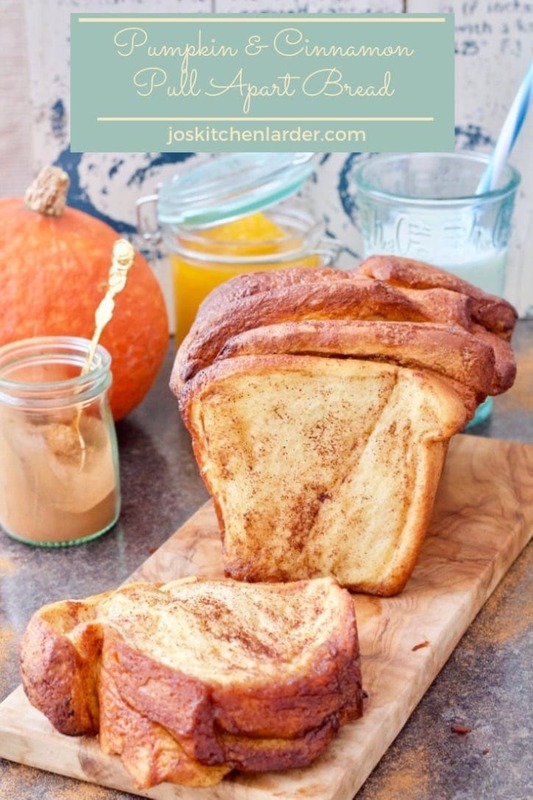 If you love laid back weekend mornings when you take your time over whatever your brekkie/brunch of choice is that day, this loaf would be perfect addition to one of these. I must admit, because of the amount of cinnamon used in this recipe the flavour of pumpkin itself is slightly diminished. However, its presence in the dough allowed me to reduce the amount of milk used and also introduce a little bit of pumpkin goodness! For all my pumpkin bakes on the blog I use my own pumpkin puree. If you’d like to find out how to make it, check out this Easy Homemade Pumpkin Puree post. 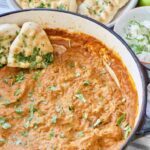 One thing to bare in mind is that the consistency of homemade puree tends to be more watery than that of the kind you can buy in a tin. 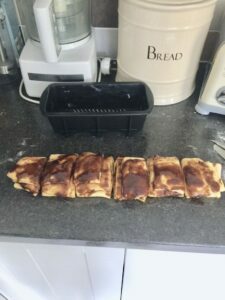 If you use tinned puree for this recipe you might want to add a little bit more milk as you knead your dough but only if it appears too dry so do not increase the amount of milk at the start. 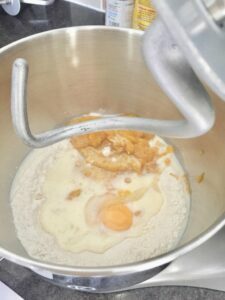 When using homemade puree, on the other hand, due to its higher water content you might have to add a bit more flour as you knead your dough to get the right consistency. One word of warning though, try and add as little as possible as too much flour will make for tougher loaf. 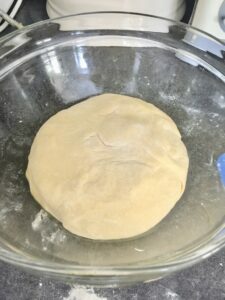 It’s good to knead the dough for a while before adding more flour too early as on many occasions it’s not kneading the dough enough what’s responsible for stickiness rather then need for more flour. In my case (using my homemade puree), I had to add 2 extra tablespoons of flour plus a sprinkle on my worktop too. This scrummy loaf is best eaten on the day you bake it, still slightly warm although I find it as delicious the day after. Sometimes on a second day I pop a slice in a microwave for a few seconds to freshen it up a bit which does the trick (please don’t judge 😉 ). 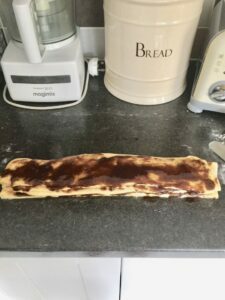 If you are feeling really indulgent you could drizzle your loaf with a little icing but personally I find it’s perfect as is with a mandatory cup of milky coffee for me or hot chocolate for the little ones who love this loaf too. If you are into the autumnal flavours and like baking with pumpkin try these Pumpkin & Cinnamon Muffins with Plum Jam or Nutty Pumpkin & Banana Bread with Chocolate Chips. Alternatively, these Easy Healthier Pumpkin Pancakes would make another fantastic weekend breakfast! These Crunchy Pumpkin Cookies would make perfect weekend bake with your kids – get those cookie cutters ready! 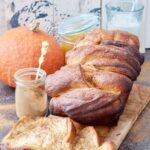 For more yeasty bread inspiration these Easy Yoghurt Bread Rolls and Sweet Blueberry Buns with Lemon Glaze are definitely worth a look! 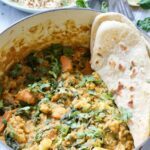 Put all of the ingredients in the mixing bowl and knead until the dough becomes silky and easy to work with. Turn the dough out onto floured surface and shape into a ball. Put shaped dough in a lightly oiled bowl, cover and leave to prove until doubled in size. 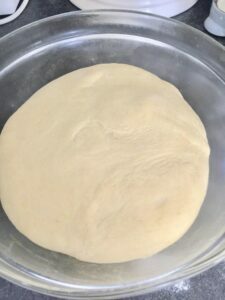 Proved dough ready to be turned out and rolled into rectangle. 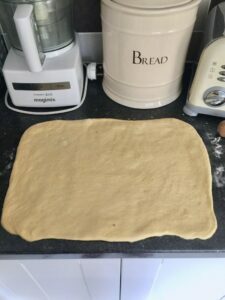 Stretch the dough or roll it out gently into the shape of rectangle approx 45x30cm. 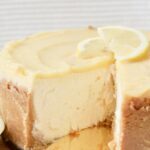 Prepare cinnamon butter filling by melting butter in a small saucepan and mixing it together with sugar and cinnamon. 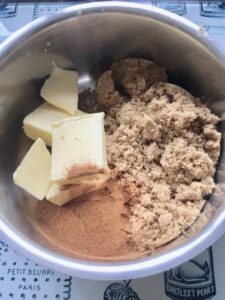 Mix cinnamon butter mixture together until well combined. Spread the cinnamon butter filling evenly over the dough and cut it into 4 even size strips (lengthwise). Pile the strips on top of one another. 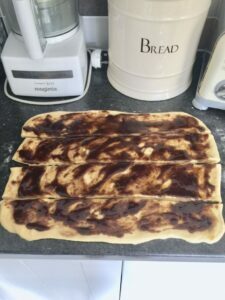 Cut piled up strips of dough into 6 equal pieces. 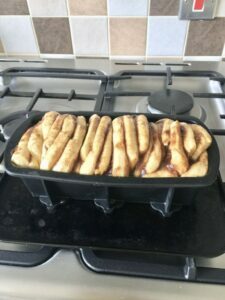 Place your 6 pieces “standing up” snuggly in your loaf tin. Cover it and leave it for second proving approx 30 min. until it puffs up slightly and you are ready to bake! 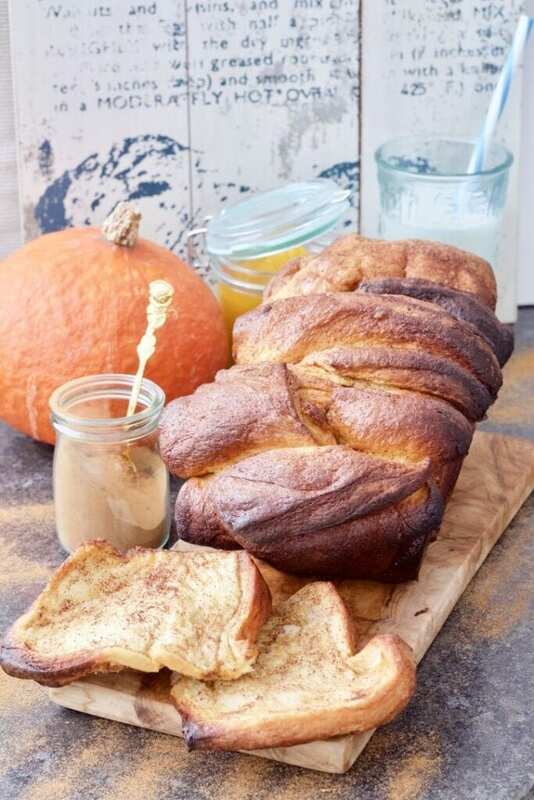 Sticky and delicious autumnal treat for pumpkin & cinnamon fans. 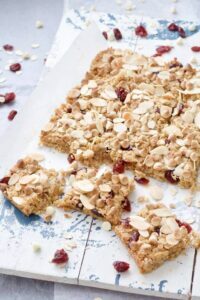 Perfect with a glass of milk or a hot cup of cocoa. Make sure all the ingredients are at room temperature or as stated above. 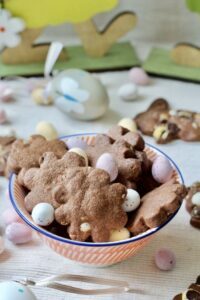 In a large bowl or in a bowl of your standing mixer (if using) mix flour and dried yeast. Follow with the remaining ingredients and start kneading.This dough has quite sticky consistency and depending on the flour you are using and also your pumpkin puree you might need a little bit more flour (I've added additional 2 Tbsp + some on the working surface) to get the dough which was quite silky and easy to work with. Once finished kneading make your dough into a ball and put in a large, lightly oiled bowl. Cover and leave it in warm place for 45 min - 1hr until doubled in size. When your dough is looking ready prepare your cinnamon butter filling. 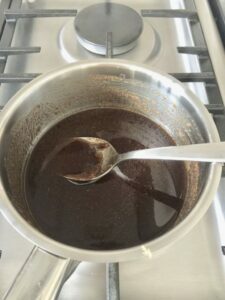 In a small saucepan melt your butter, add sugar and cinnamon and mix until well combined. 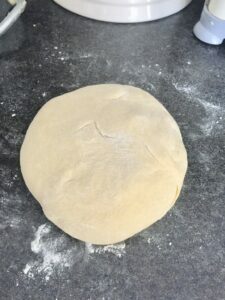 Put your proved dough onto lightly floured surface and stretch it or roll gently to the shape of rectangle (roughly 45 x 30cm). Spread butter mixture evenly all over the dough and slice into 4 equal size strips (lengthwise). Pile the strips on top of one another and cut into 6 equal pieces. Place your 6 pieces "standing up" snuggly in your loaf tin and leave it covered for second proving (approx. 30 min). Bake in 180C/350F/Gas Mark 4 oven for approx 40 min. If you don't want your loaf to be too brown simply cover it with aluminium foil during first 20 min of baking. Once baked let it cool slightly in a tin before turning out and enjoy whilst still warm! Nutritional information is approximate, per loaf and meant as a guideline only. If you don't have vanilla sugar you can add 1 tsp of vanilla paste or extract or seeds scraped out from half vanilla pod. Check out this post for details on how to make your own vanilla sugar. If using tinned pumpkin puree you might have to add a bit more milk as you knead the dough. Please take care and do it gradually and only if needed and not at the start. If using homemade pumpkin puree which has got slightly more watery consistency, you might knead to add a little bit more flour. Again, do it gradually and only if needed. Pin Pumpkin & Cinnamon Pull Apart Bread for later! Fiesta Friday hosted by Angie, Jhuls at The Not So Creative Cook and Jen at Apply To Face Blog. This looks so inviting. I’d love to try making something like this. I’m sure my husband would like it too. we’ve never actually cooked with pumpkin, we only ever buy them to carve. This looks and sounds delicious. This looks amazing. I love this sort of bake. its pinned for late as i have to try this! 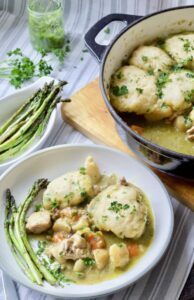 Loving the sound of this recipe.Absolutely stunning pics too. I love Cinnamon with a passion and enriched bread is another. So I’m a gonna here! The pumpkin season is here!! This looks awesome, Jo! 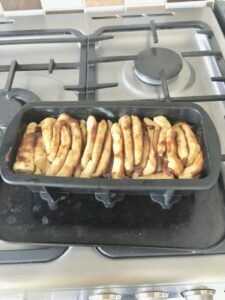 I tried making pull apart bread, but it failed the first time. You are reminding me now to try again. Thanks for sharing and happy Fiesta Friday! This looks absolutely amazing! You are a star baker! Hi there – visiting from the Fiesta Friday party. This looks amazing! I host a recipe party on Sundays. Would love to have you join. Hope your weekend is fantastic. Oooh Autumn is very much upon us when I see the pumpkin bakes! I don’t think I’ve seen any pumpkin bread recipes before, I love the colour it brings to the dough. This looks so tasty! Wow this looks absolutely gorgeous! This bread sounds absolutely delicious! I can just imagine how wonderful it smells as it’s baking. I’d love some for breakfast with my coffee. Thanks for sharing with #CookOnceEatTwice!